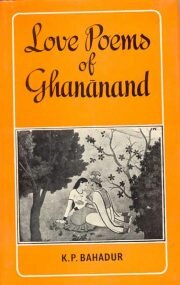 The poetry of Ghananand depicts love in all its aspects. Breaking away from the orthodox poetic traditions he gave Hindi poetry spontaneity and freshness and brought it nearer to life.He fell in love wiht Sujan a sourtesan in the darbar of emperor Mohammad Shah. Having refused to sing when asked by the Emperor he agreed when requested by her. K.P. Bahadur who is a senior officer of the Indian Administrative Service has distinguished himself by writing a number of books on Philosophy Religion and other miscellaneous subjects. Four of his other works have been approved by the UNESCo in the Indian Translation Series-----The Rasikapriya of Kesavadasa Selections from Ramacandrika.